LG devices from Sprint are different in a sense they cannot be unlocked via unlock code such as the conventional unlocking methods in which you can simply enter the unlock code. However, Cellunlocker.net has come up with a solution to factory unlock your Sprint LG device. This service is different from our conventional services as it will require a data cable, PC and internet connection. 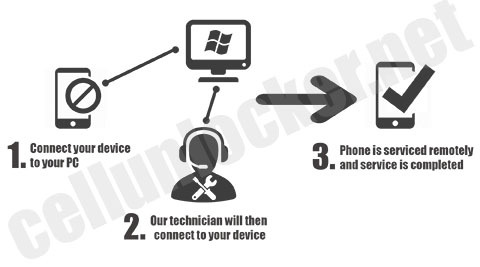 Our certified technicians will then connect to your device and service your phone depending on the service required. We use this service as an alternative if your unlock code for your device is not available, or you require a special service for your device. Once connected to one of our technicians, the process will take anywhere from 10 to 40 Minutes to unlock your LG Phone. Cellunlocker.net can unlock almost every LG Phone from Sprint up to date. As mentioned before, we can unlock devices that even Sprint cannot unlock themselves and models which they state cannot be unlocked. The Step by Step process is so easy do it from home and our certified technician will guide you through the unlock process. We can even Unlock the devices Sprint will Not Unlock for you! Keep in mind, Unlocking a Sprint Device is 100% Legal. It does NOT void your warranty, contract or effect the plan you currently have.